In 1924, a home renovation in Duxbury, Mass., uncovered this Italian-made wheellock carbine. It had been safe for centuries in a secret compartment next to the front door—it was likely first stored there so it would be handy in case of Indian attack. The home was built around 1654 by members of the Alden family—a family whose roots date back to John Alden, one of the Pilgrim leaders of Plymouth Colony, who came over on the Mayflower in 1620. So the gun survived hidden away, waiting. Schreier says his research indicates there is no doubt this gun was at the first Thanksgiving at Plymouth Colony in 1621. Alden undoubtedly also hunted with it and perhaps used it to kill a wild turkey for the feast America's school children still learn something about today that led to Thanksgiving. Whether or not this gun was used to hunt wild turkeys, we know it was kept to defend the young colony. Alden, who signed onto the Mayflower as a 20-year-old cooper, joined Captain Miles Standish’s Militia to defend the settlers from possible attack. He was also a signatory of the original Mayflower compact. His rifle was a single-shot originally chambered in .50 caliber, says Schreier, but extensive use removed almost all traces of its rifling. Today, after years of use, repairs and modifications, the gun would require a .66-caliber ball. This rifle is a rare, real glimpse back to that often mythologized time of our nation’s tentative beginning. A gun is too politically incorrect to appear in school textbooks these days, but that’s a shame because it clearly shows what the first European Americans used to defend themselves and to hunt with to put food on their table. This Italian-made wheellock carbine found in 1924 is traced to John Alden, who brought it over on the Mayflower and had it in his possession during our nation's first Thanksgiving in 1621. In 1621 the fabled feast at Plymouth Plantation came about in large part because of Squanto, a Patuxet Native American. Much like Pocahontas, Squanto taught the pilgrims how to catch eel and grow corn and served as an interpreter. (Squanto had learned English while enslaved in Europe.) Squanto negotiated with the Wampanoag chief, Massasoit, and got him to give food to the starving pilgrims during their first winter. Because of Squanto’s help, the feast now referred to as the first Thanksgiving was held in early October 1621 and was celebrated by 53 Pilgrims, along with the Native American chief Massasoit and 90 members of his tribe. Three accounts of the Plymouth Plantation’s Thanksgiving feast survive: "Of Plymouth Plantation" by William Bradford; "Mourt’s Relation," which was probably written by Edward Winslow; and "New England’s Memorial" penned by Plymouth Colony Secretary Captain Nathaniel Morton. The celebration lasted three days and featured a feast that included ducks, geese, wild turkeys, fish caught by the colonists and five deer killed by the Wampanoag. Afterward, festivals of Thanksgiving were observed sporadically in the colonies and tended to be autumn-harvest celebrations. But in 1789, Elias Boudinot, a member of the U.S. House of Representatives from Massachusetts, moved that a day of Thanksgiving be held to thank God for giving the American people the prudence to create a constitution that safeguarded freedom. A Congressional committee approved the motion and informed President George Washington. On Oct. 3, 1789, Washington proclaimed, "a day of public thanksgiving and prayer” on Thursday, the 26th of November. But Thanksgiving faded away for decades after President James Madison proclaimed a day of Thanksgiving to be held on Apr. 13, 1815. Most of the credit for the permanent establishment of a Thanksgiving holiday goes to Sarah Josepha Hale. She was the editor of Ladies Magazine. She argued for the return of Thanksgiving in articles and by lobbying politicians. After years of crusading, she swayed President Abraham Lincoln. On Oct. 3, 1863, Lincoln proclaimed a national Thanksgiving Day be observed every year on the fourth Thursday of November. The National Rifle Association’s National Firearms Museum in Fairfax, Va., has this gun on display. 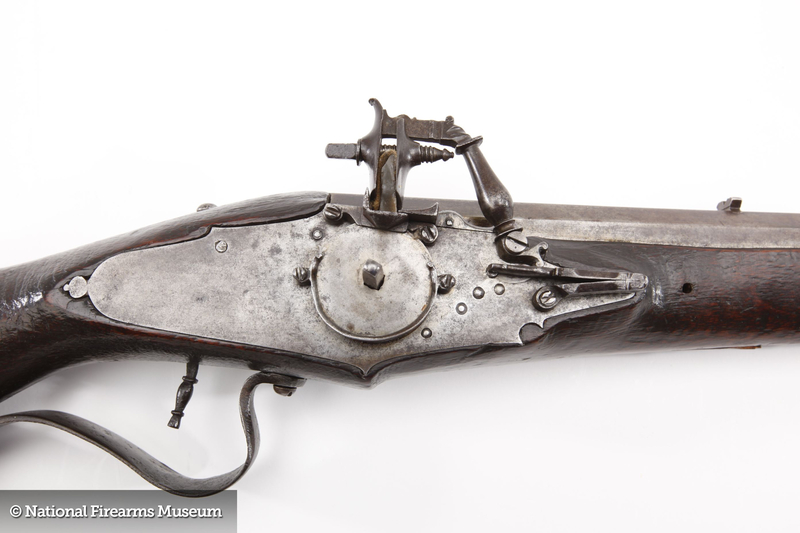 They affectionately call it the “Mayflower gun.” According to curators at the museum, markings on its barrel and lockplate indicate this gun is connected to the original Beretta family of armorers. The surviving detail of its wheellock device—the rotating mechanism, which provides spark and ignition—is a thing of fine craftsmanship and a link to our first Thanksgiving. Editor's Notes: Frank Miniter is the author of "This Will Make a Man of You—One Man’s Search for Hemingway and Manhood in a Changing World." To watch the video of NRA's Phil Screier talking about the "Mayflower gun," click here.